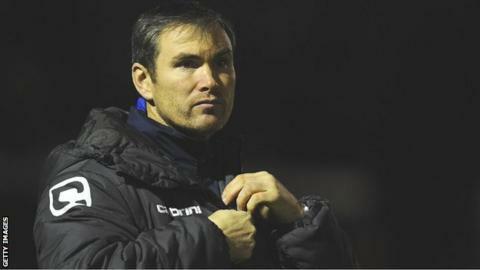 Manager Kevin Wilkin says a summer of major changes at Wrexham is likely to start as early as this week. The Welsh club were 17th in the Conference Premier - their lowest finish since being relegated in 2008. Wilkin, 46, took over as manager in March and says he is prepared to upset people in his quest to get the club back into the Football League. "The process will start on Tuesday - we've had interim talks with one or two players already," he said. "I've got to make changes - some of them may be a little bit unpopular with one or two people. "But [there is] nothing is personal in what I do - all I want to do is get Wrexham into the Football League. "And if that means upsetting one or two people along the way, well then that's how it has to be." The 1-1 draw at Forest Green Rovers ended a season which saw the Dragons' form slip after missing out on promotion in a 2-0 defeat to Newport County in the play-off final at the end of the 2012-13 season. It also saw the departure of player-manager Andy Morrell as Wrexham failed to reproduce the form which had made them title contenders in previous seasons. Former Nuneaton Borough boss Wilkin says his "bare minimum" target is to be challenging for play-off places. "My minimum requirement is to be in and around the play-offs. "There'll be lots of changes and I need to get it settled down as quickly as possible." But they have to be the right boys who buy-in to what I'm trying to do at Wrexham football club and the culture that I want to try and develop."